To ask any questions or book a tour, contact us today. Choose from our eight private suite types. 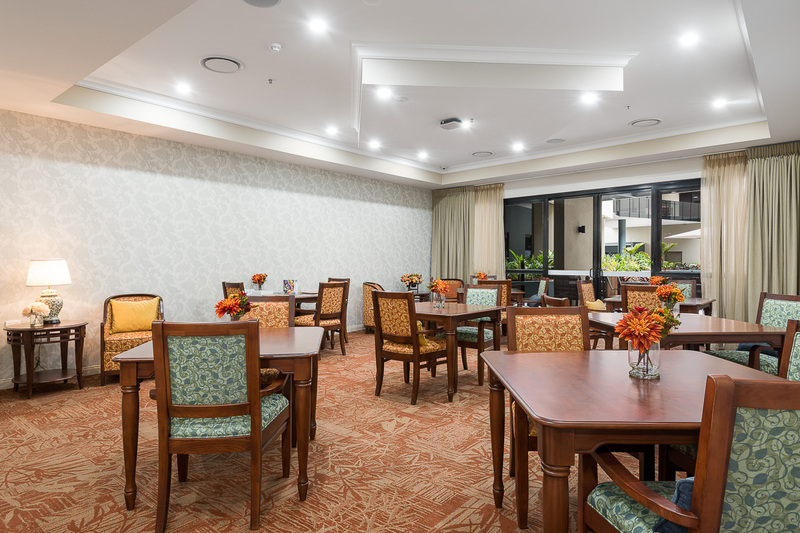 All aged care suites are on levels Ground to Level 3 with a size varying from 23m2 to 54m2. Our stunning, fully-furnished suites are designed to help you maintain your discerning lifestyle yet receive all the care and support that you require. All suites include a flat screen TV, microwave, fridge, nurse call buzzer, built-in robe and large ensuite. All suites have indirect access to large communal lounges and balconies that are host to the beautiful views of the surrounding suburbs and to the Portofino Piazza. 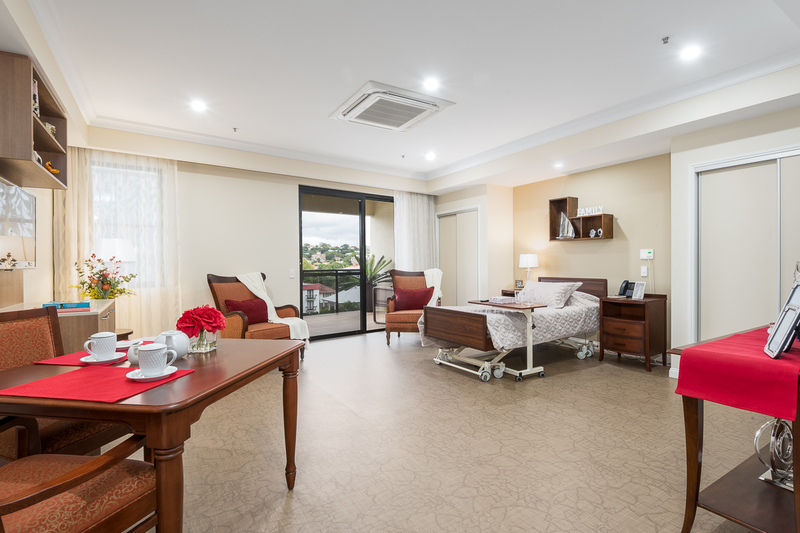 Our Aged Care Suites also includes a 15 bed Special Care Unit for those with memory support requirements. If living in an apartment would be to more of your liking, view our apartments living options in the accomodation tab. Portofino’s Classic Suite in our Special Care Unit (dementia) is a single room and includes your own private ensuite and kitchenette. These suites are large in size (24m2– 25m2) in a specialist secure environment, providing peace of mind and safety. Residents have full access to a protected outdoor area including activities room. Take in the views of the surrounding vista from your Superior Suite. Our Portofino Superior Suites are large rooms (23m2– 31m2) on Levels 1 and 2 with your own personal kitchenette. The expansive 6m2 bathroom is fitted out with beautiful tiles and quality fittings, a special place for a bit of pampering. Choose from two configurations in our Grand Deluxe Suites in the Special Care Unit. The first style is a very large room (26m2– 27m2) and the second style is a large room (23m2– 26m2) in the quiet end of the unit. All Grand Deluxe Suites are single rooms and includes your own private ensuite and kitchenette. Residents have full access to a protected outdoor area including activities room. Levels 1 and 2 is where you will find our standard Grand Deluxe Suite. These are large to very large suites (23m2– 31m2) with private ensuite and kitchenette. 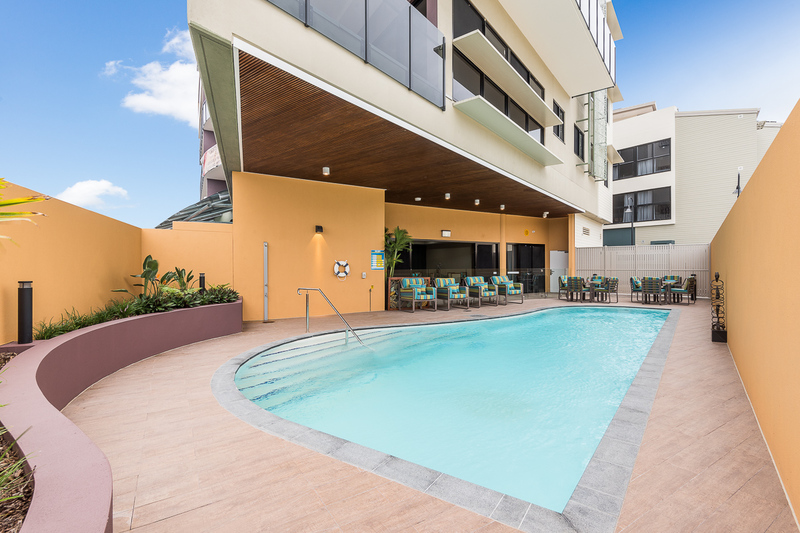 All Grand Deluxe Suites have direct access to the communal balconies with some rooms having their own semi private balcony which is shared with a limited number of suites. With an average size of 29.4m2 our Imperial Suites are very large rooms (24m2– 31m2) located on Levels 1 and 2. Enjoy the additional seclusion on your semi-private balcony which is only shared with maximum two other units. A good sized ensuite and personal kitchenette come standard. Are you used to having lots of space; then Portofino’s Executive Suite is for you. 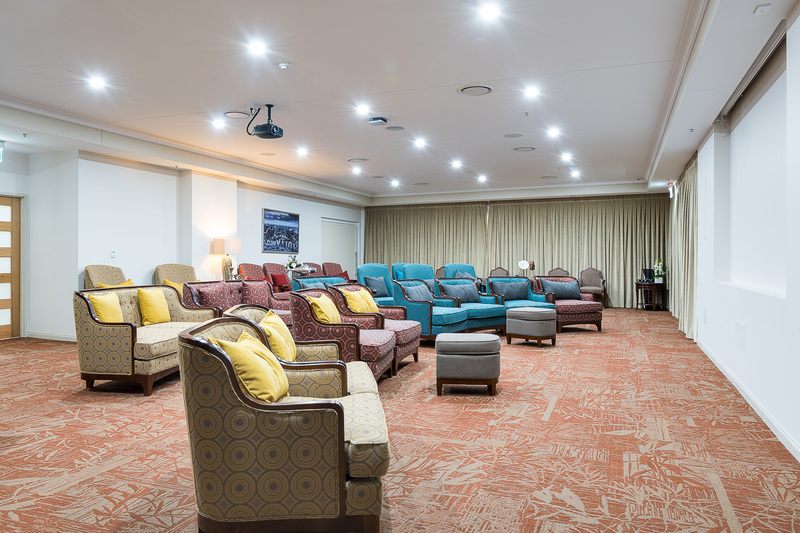 Our Executive Suites are very large suites (42m2– 48m2) and are on Level 3. Each has a plush single ensuite, great views, communal balcony access and your own kitchenette. It will be difficult to pick which of the seven Signature Suites you will like the best. All Portofino Signature Suites are on Level 3. All are very large rooms (42m2 – 52m2) with spacious single ensuites, kitchenette and semi-private balcony or terrace access. There is only one but, oh, what a room! Our Royal Suite resident will enjoy the expansive views from Level 3. In fact choose your view from either of your two private balconies. At 54m2, this extra large room has a spacious ensuite and your personal kitchenette. To complement the exemplary care, Portofino Hamilton has been designed to enhance each person’s lifestyle. Beautiful views north, south, east and west are on offer throughout the contemporary designed accommodation towers. 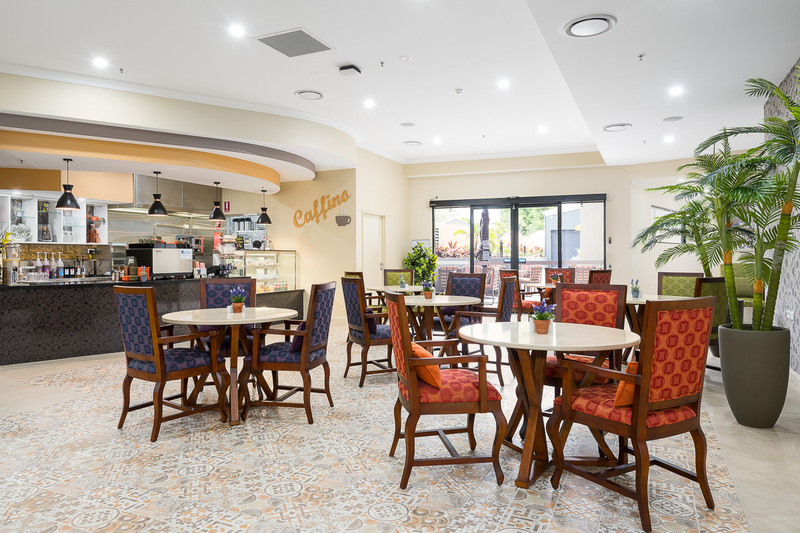 Connect with family, friends and the broader community in Portofino’s café, the many recreation and activities lounges, our theatre and external areas. The internal Piazza is bathed in natural light and features an open air large screen TV for outdoor entertainment and movie nights. Relax on the balcony with a book, or join in on the extensive range of activities including: exercise classes, worship services, shopping trips, movies, concerts, games and theme days, as well as Happy Hour. 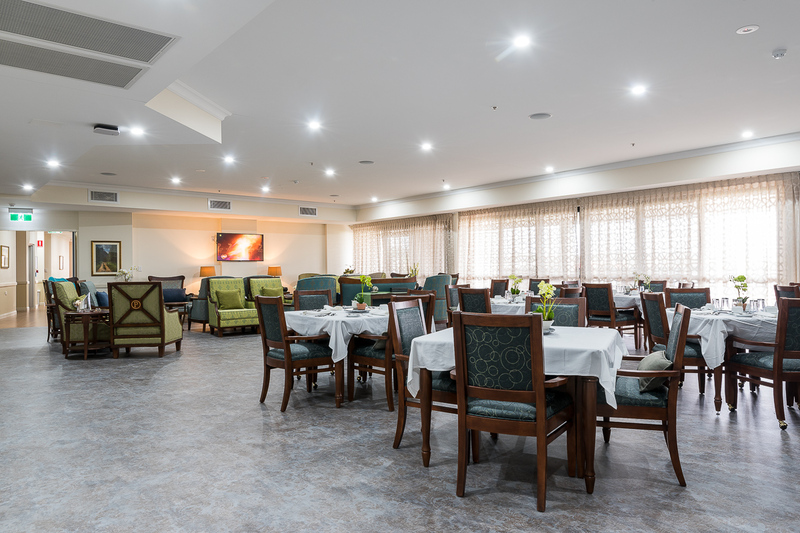 The Servizi Additional Services package provides extensive supplementary services including additional menu choices, a variety of additional snacks, as well as alcoholic beverages. Enjoy our 12 channel Foxtel package or choice of over 100 movies on demand on your large wall-mounted flat screen television. In room refrigerator, microwave, WI-FI access and personal control of your air-conditioning also come inclusive of the Servizi package. *refer Servizi Agreement for the full and latest details.